DevaCurl Low-Poo Delight fights frizz and oiliness for effortless, natural waves. It all starts in the shower. Low-Poo Delight brings out the beauty of natural waves. The balanced, light formula cleanses the scalp and hair with mild lather while fighting frizz and oiliness. Delight is made with rice protein for body, lotus flower for bounce and chia-flaxseed extract blend for defined, frizz-free waves that last. Delight will help your clients spend less time styling and more time living life. 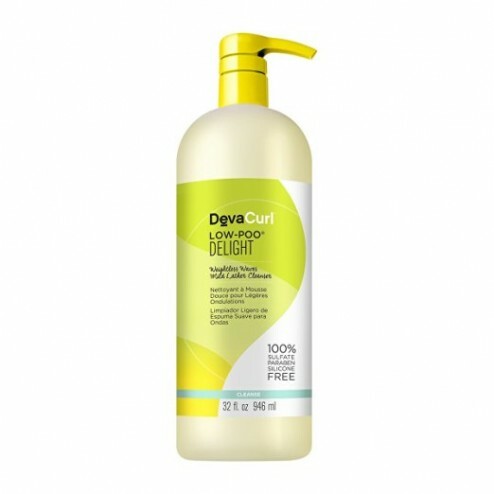 Wet hair thoroughly and apply Low-Poo Delight with a luxurious massage, concentrating on the scalp. Make sure to rinse thoroughly by massaging the scalp again as the water runs through the waves.